Escape Egress Windows - Exclusive Escape Egress Window Mft. - Escape Window & Well Corp.
Vents like a standard single hung window. One hand operation for quick exit. MEETS 5.7 SQUARE FEET AT AN OVERALL SIZE OF 28" x 46". 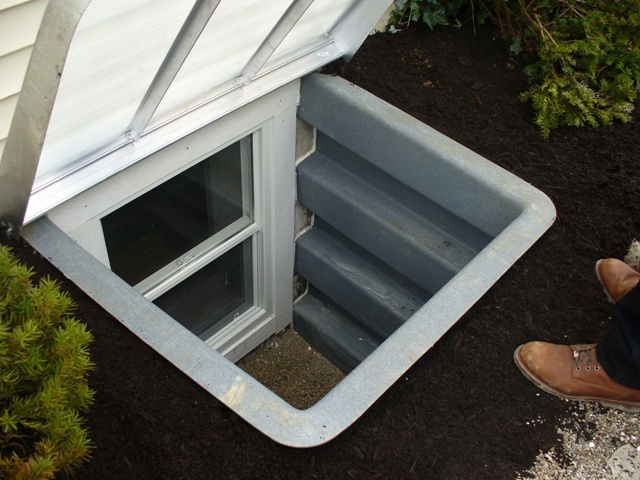 IN FINISHED BASEMENTS, BY LAW, A SECOND MEANS OF EGRESS IS REQUIRED. Click here to watch an installation video of how the Escape™ Egress Window keeps your home up to code and your family safe. Your Escape™ Egress Windows will be custom-made to fit your home's window openings. This means a precise installation without costly construction changes or performance problems caused by improper fit. Escape™ Egress Windows fusion-welded corners are exceptionally strong, providing smooth operation and lasting resilience to seasonal changes, weather extremes and long-term use. Enjoy the Convenience and Ease of Swing-in Cleaning. Window cleaning is so easy with Escape™ vinyl windows. When you release the swing-in multi-point latch, the swing frame opens inward and allows for safe, quick, easy cleaning of the outside glass and sash. After cleaning, you swing the frame closed and latch the multi-point lock to securely fasten the frame. No ladders, no uncomfortable bending or stretching - just easy cleaning. When you choose Escape™ Egress Windows you are selecting a quality, well-built product that provides safety and year-round comfort for your family. In the event of an emergency, your family will be able to escape safely because the emergency latch is quick and easy to open and is within easy reach for anyone ( children, senior citizens, handicapped, etc. ). The competition cannot make this claim. Escape Window & Well Corp. is so confident of the quality of Escape™ Egress windows that they provide a lifetime limited warranty on all vinyl components against blistering, corroding, flaking, peeling or rotting.